Voted “Best Cookies” by the readers of the Daily Herald, Jarosch Bakery is renowned for our melt-in your-mouth butter cookies. Whether you’re giving a box as a gift or serving trays of these delicate treats at a banquet, we offer 25 varieties of these scratch made cookies your guests can enjoy! There is no pre-ordering of specific cookie types. If you would like certain kinds of butter cookies, we invite you to come to the bakery between November 26th - December 14th and we'll pack up all of your favorites while you wait! We'll happily shrink wrap your boxes, and we highly recommend freezing them until Christmas. It works - we've tried it! Give us a call if you have any questions - our friendly staff is happy to help! Looking for a unique gift or hosting a function? Give your guests an irresistible bite-sized treat with Jarosch Bakery butter cookie boxes and trays! We hand decorate each of these tasty and colorful cookies with colored chocolate, sprinkles, and nuts while others are sandwiched with chocolate, strawberry, raspberry, or apricot fruit preserves. 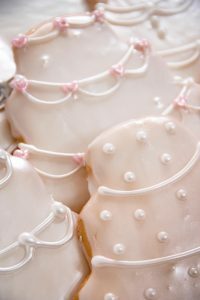 Whether you’re planning a baby shower or want memorable wedding favors, you can add a sweet touch to your next event with Jarosch Bakery custom cookies. Decorative cookies can be customized with various shapes and designs, from names & numbers to pirate faces and monsters. For corporate events, we can pipe on your company logo with fondant icing or scan it as an edible image onto our sugar cookie. If you're giving cookies as gifts or favors, save time by letting us wrap them for you! We offer a few options at additional costs. We generally require two weeks notice for custom cookie orders; however, if you have a time constraint, give us a call and we can discuss options. Prices vary based on design requests. Our customers are always bringing us interesting designs for fun & memorable cookies! When deciding on the perfect custom cookies for your event, we have a variety of cutters to choose from or you may bring in your own cutter and design ideas. Here's a selection of popular styles and unique designs from our portfolio to inspire you! Custom cookies do have minimums depending on the style so call us for more info. Contact us in Elk Grove Village, Illinois, to discover for yourself the addictive power of our hand-made butter cookies! 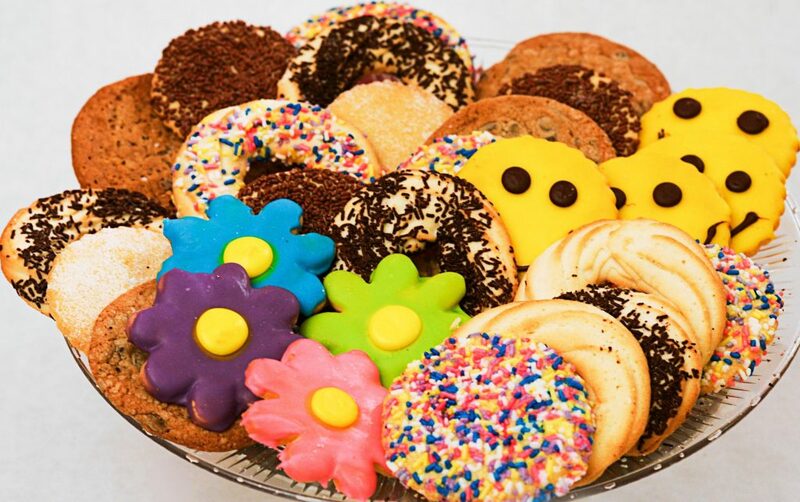 We proudly accept orders for cookie trays from customers throughout the Chicago Metro area, as well as all over the country.